TOKYO, April 3 (TNA) — Thai Prime Minister Surayud Chulanont and his Japanese counterpart Shinzo Abe on Tuesday signed a landmark free trade accord which proponents in Thailand hope will boost bilateral trade, but which has drawn protests from non-governmental organisations and environmental activists. The signing ceremony was held in Tokyo on the second day of the Thai leader’s four-day official visit to Japan. The Thai Cabinet approved the pact last week after it was debated in the National Legislative Assembly. Both sides wrapped up talks on the draft accord early last year, but the signing was delayed because of the political turmoil in Thailand that led to the September 19 military coup. Japan is Thailand’s biggest foreign investor and an important export market for Thai products with trade between the two countries valued at Bt1.65 trillion (US$44.1 billion) during calendar 2006. Senior government officials trumpeted the accord as a vehicle to boost trade and investment, particularly for Thai agricutural exports as well as for the auto industry and building up Thailand’s pool of skilled labour during the coming 5-10 years. However, opponents of the agreement criticised the government for not making its terms public. 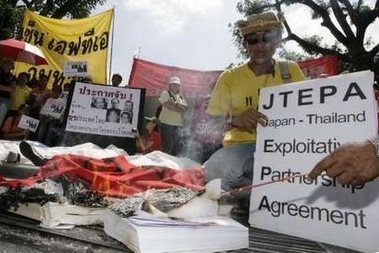 Some 50 demonstrators gathered Tuesday in front of the Japanese Embassy in Bangkok and burned a copy of the accord to protest the signing of JTEPA. They also demanded that National Legislative Assembly (NLA) members submit a request for the Constitution Tribunal to invalidate the pact. Besides burning the 942 page text, the demonstrators read an open letter signed by representatives of the five participating groups — the FTA Watch Group, the Alternative Agriculture Network, the AIDS Patient Network, the Consumers Network and the Slum Dwellers Network. Saree Ongsomwang, manager of the Foundation for Consumers, said that her organisation and the alliance would like to urge at least 20 NLA members to sign a petition and submit it for the consideration of the Constitution Tribunal.